One of the best things about making something yourself, is being able to make it the way you enjoy it. I wouldn’t consider myself a picky eater (frog legs are something I’ve enjoyed twice! ), but there are some foods stuck on my “hit or miss” list. Hot Cross buns would be one of them. For me, a really tasty Hot Cross bun has loads of spice, raisins and dried cranberries. I omit the lemon and candied fruit, and increase the sweetness of my bread by using dark brown sugar. I like a glaze on top, not loads of icing. So you can see, it’s really better if I just make them the way I like them. 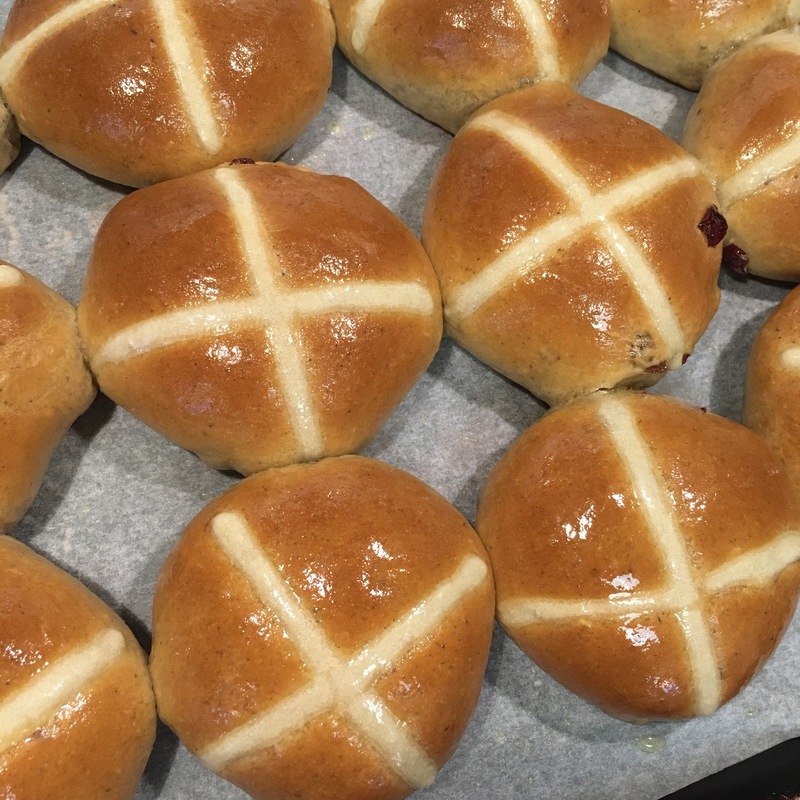 The thing is, lots of people avoid Hot Cross buns for the same reasons, and that’s such a shame! 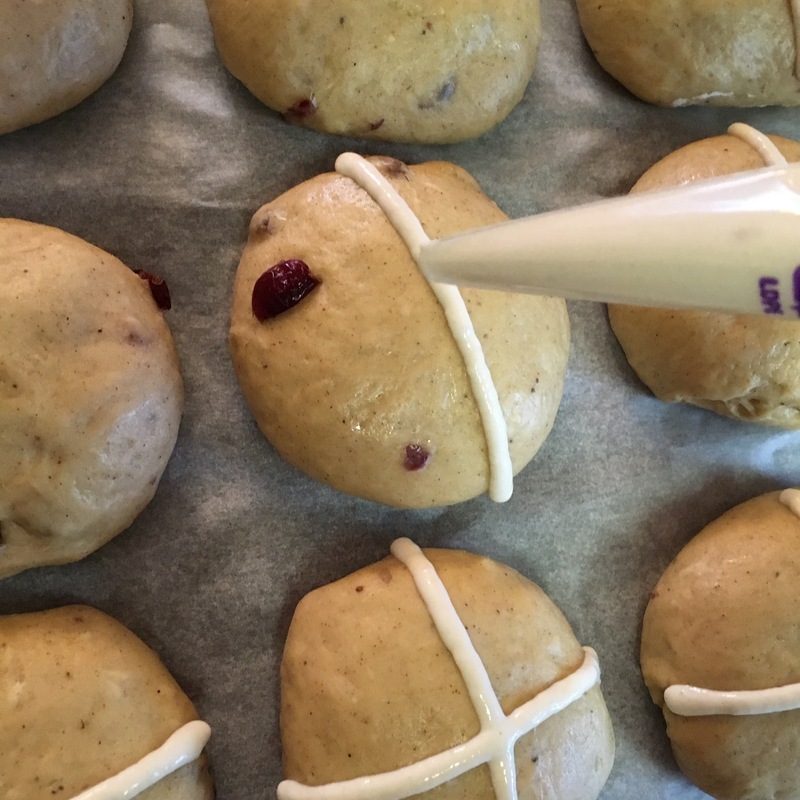 If you are at all comfortable in your kitchen, you can make these delicious, Easter treats for you and your family, exactly the way you want to enjoy them. I’ve added the word “Optional” to some of the ingredients, but try not to omit all of them. 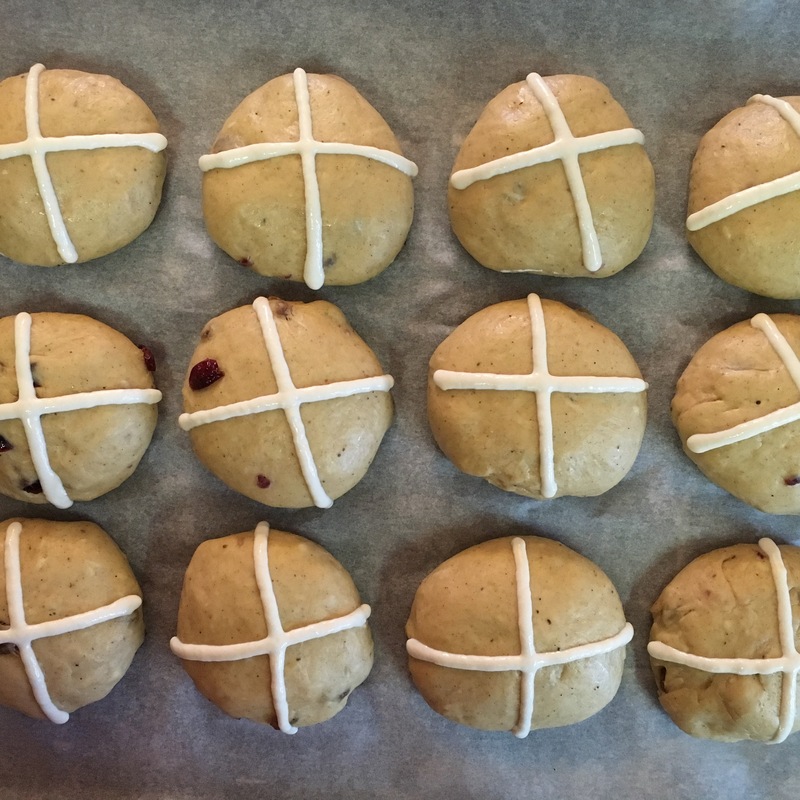 A Hot Cross bun should have something in it… otherwise it’s just a sweet roll. Wait, maybe that’s just what you want. Look, there I go contradicting myself! Okay, ignore me. You can make these any way you like them. All you need for this recipe is a day at home, and a little patience. You don’t spend a lot of time working on them, but you do need to be around to monitor. Read a book, do your laundry, binge watch The 100 on Netflix. It’s easy, I promise. enough water to make a glaze, about 1-4 tablespoons, depending on how thick you like it. Heat your milk and water in a saucepan on medium/low heat until it’s just warm enough that you can put your finger in it comfortably – but not so warm that you will burn yourself. If you have a candy thermometer, the best temp is between 105-110 F, but you can definitely do a finger test as well. 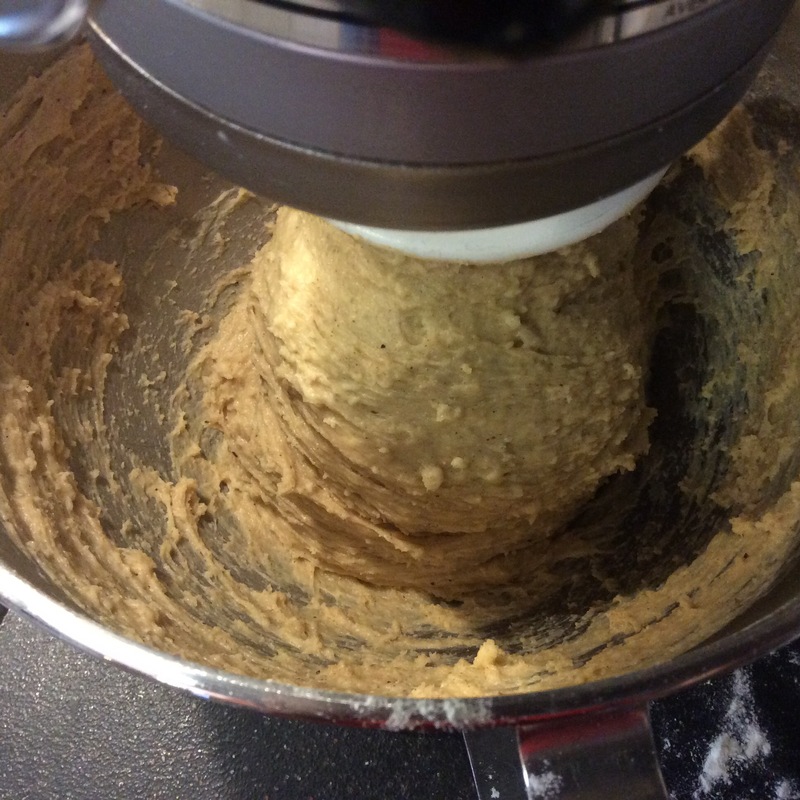 Place the warm milk into the bowl of your stand mixer, and fit with a dough hook. Add the yeast and brown sugar, stir together and let sit for a minute or two. Add in the spices, salt, melted butter, and start with 3 cups of flour. Mix well on medium speed. Add in your eggs, one at a time. 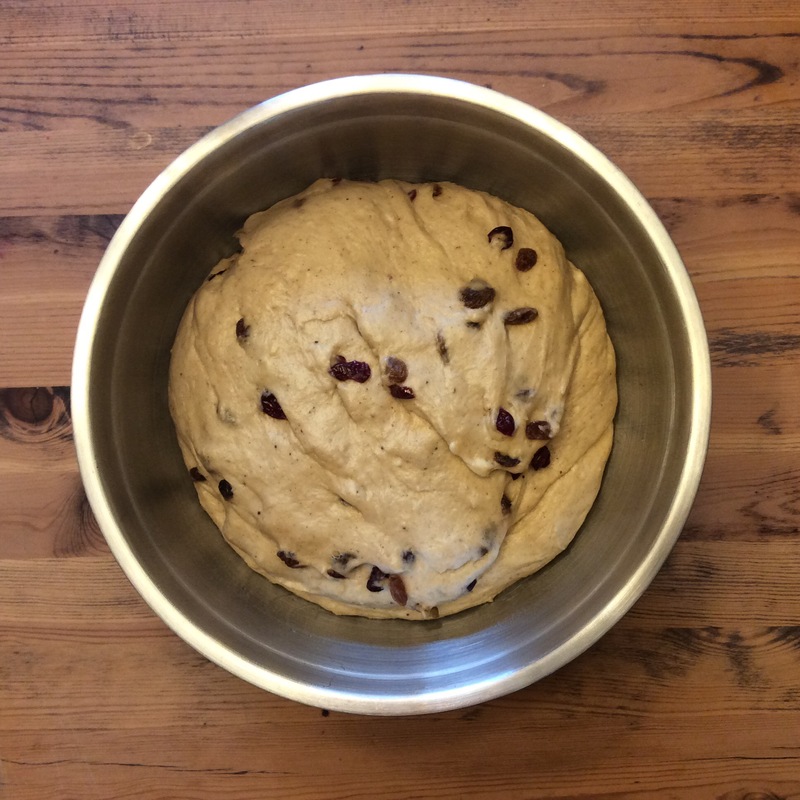 The dough will look like it’s separating or getting chunky, that’s okay. Add another cup of flour, and then add flour by 1/4 cups until you reach the desired consistency. For me, that amount was 4+3/4 cups. Mix on medium speed for about 2-3 minutes. 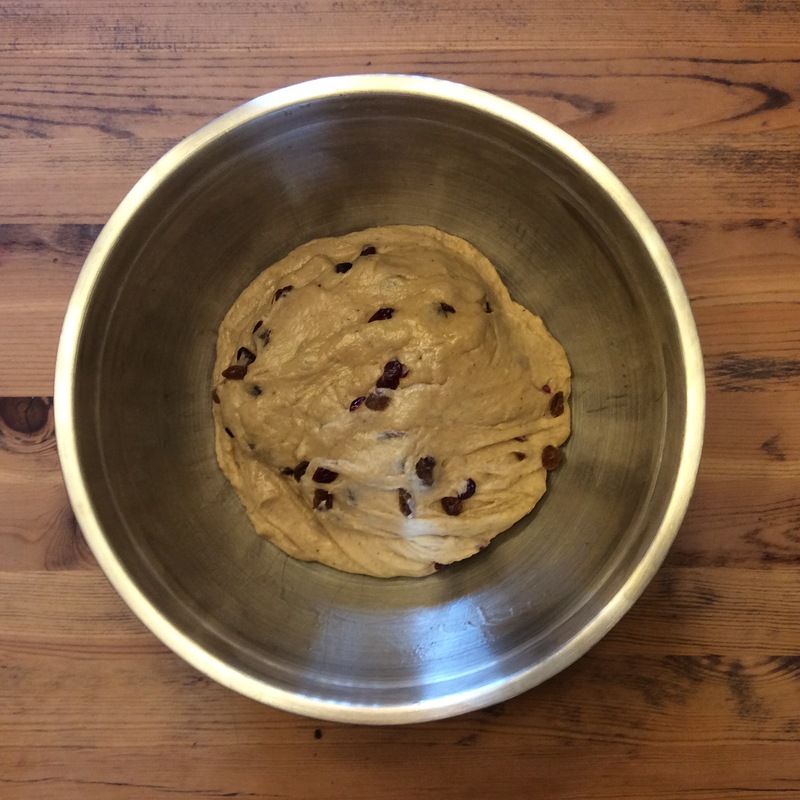 Your dough will look sticky, and will still be sticking to the bottom of the bowl, but it wont be liquid or batter-like. See photo. At this stage, mix in your optionals. I went with 1/3 cup of raisins and 1/3 cup of dried cranberries. So far, this whole thing has taken 10 minutes. Lightly oil a large bowl (I use olive oil, but you can use shortening, or veg oil, or whatever you have on hand) and turn the dough out into the bowl. Turn to coat. Cover with a towel or plastic wrap, and let it rise for an hour until double. Depending on the temp of your kitchen, and the yeast you use, it may take up to 90 minutes. 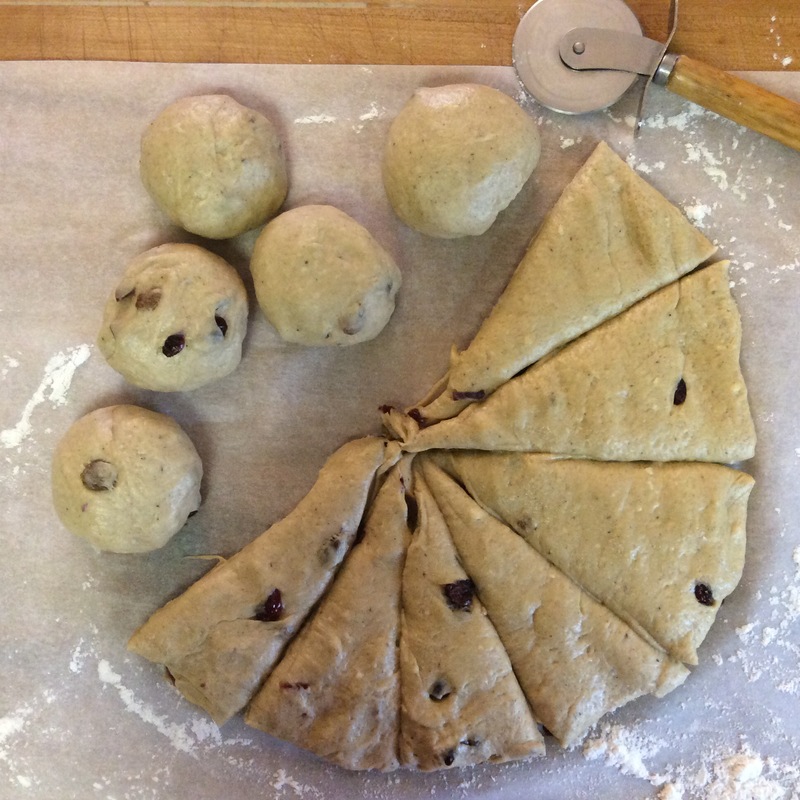 Turn the risen dough out onto a floured surface, and pat down to get all the air bubbles out. Cut into 12 equal pieces. Roll each section into a ball. Place on a large parchment lined cookie sheet and pat down to about 1″ thickness. Leave about an inch between each one. You can chose to bake them in a greased 9×13 dish, and have them rise higher instead of wider. I used my large cookie sheet. Cover loosely with plastic wrap or a towel, and let them rise for about 30 minutes. This part took about 10-15 minutes. 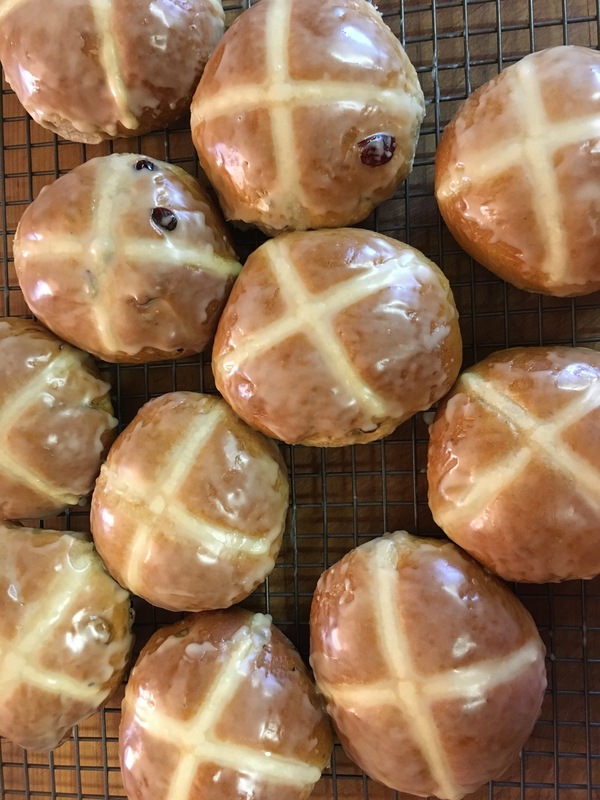 Once your oven is hot, the 30 minutes are up, and the buns have risen up nicely, it’s time to make your crosses. Make the Cross Paste. Blend with a fork until it forms a thick glue. Pour this into a disposable piping bag or sandwich/freezer bag, twist closed and clip a corner open for piping. Gently pipe crosses on all of the buns. I love piping! Bake for 30 minutes, turning your pan at the halfway point for even browning. Once baked, brush your Hot Cross Buns with melted butter, and let them rest for 10 minutes. Transfer to a cooling rack and add your glaze (if using). I glazed mine. I still cut them open and eat them with butter, but I have an addiction to all things sweet and salty.